In cases where the cornea is too thin, has an unusual shape or the refraction error is too large to be corrected with laser surgery, the solution may be the implantation of an additional lens into the eye. Additional lenses are either fixed to the iris or placed behind the iris. Unlike laser surgeries of the eye, the additional lens can be removed from the eye, which means that the optical condition of the eye can be restored to the level it was prior to surgery. The safety and efficiency of the procedure are proven by the fact that Artisan/Verisys additional lenses have been implanted in eyes throughout the world over 150,000 times since 1991. 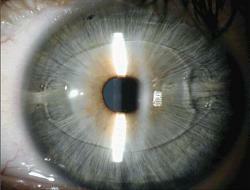 The foldable Artiflex additional lens, which requires a smaller incision, has been used since 2003. See more information. The Artisan additional lens allows for adjustment of myopia in the range of -1 to -23.5 dioptres, long-sightedness in the range of +1 to +12 dioptres and astigmatism (cylinder) up to 7 dioptres. The Artiflex foldable lens can be used to adjust short-sightedness within the range of -2 to - 14.5 dioptres. The additional lens is visible only under a microscope or by looking very closely. For optimal mobility in the intraocular fluid before the implantation of the additional lens, the ophthalmologist makes small so-called security holes in the iris with a YAG laser.